Ten burrows of the southern hairy-nosed wombat were excavated by Vernon Steele and David Temple-Smith in order to examine their structure, but a different method was used to study the burrows of both species of hairy-nosed wombats by Glen Shimmin and his colleagues. They sank narrow boreholes from the surface to penetrate the roof of the burrow. These boreholes were lined with plastic pipe and a video camera with a light source was lowered down the pipe. This enabled them to view the structure of the burrow and any wombats that might be in that area and to decide where to place the next borehole. In this way the whole burrow was mapped (Figure 3.8). Southern hairy-nosed wombat burrows vary greatly in length. The burrows and warrens excavated by Steele and Temple-Smith ranged from 1.5 to 61.2 metres, and had one or two entrances. They found another warren with 10 entrances. Their research also showed that in some burrows the wombats had built plugs of earth which blocked the tunnel they occupied, probably as a defensive measure. warrens but they are generally simpler. 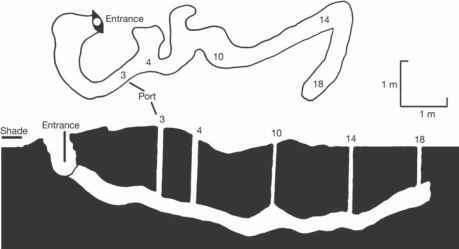 Shimmin found one warren with three entrances and a tunnel length of 54 metres, but most had only one entrance and an average length of about 12 metres. They were deeper than the southerns' burrows - up to four metres deep. Major 'core' burrows have up to 12 entrances, although the average is two to three entrances. There has been a 40% increase in the number of burrows in the last three to four years, which is good news for this endangered species. Most of these new burrows have only one to two entrances but there are signs that they are expanding in size. All of the currently active burrows of the northern hairy-nosed wombat are found along the remains of an old watercourse. 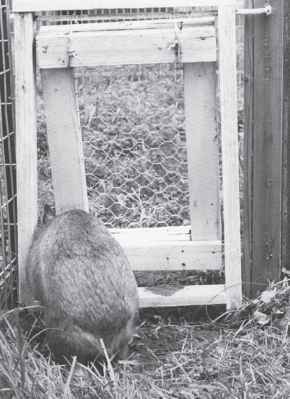 A southern hairy-nosed wombat's warren has many entrances and the burrows are interconnected. Around the warren there is a circle of small burrows with single entrances. These are about 100 metres from the central warren. Burrows of the northerns are arranged in groups that are used by four or five wombats. Well-worn paths lead to these burrows, which may have several entrances. Both species of hairy-nosed wombats choose flat ground for their burrows. The southerns seem to prefer grassland to scrub as the site for their warrens. In many parts of their range there is only a thin layer of soil covering a limestone shelf, which in turn covers a softer strata. The wombats have found weak points in the limestone and dug through to the softer ground beneath, using the shelf as a roof (see Plate 8). In other areas where there are deep clay soils the burrows are prone to collapse after heavy rainfall. Most of the northerns' burrows are in or adjacent to sandy gullies, where the sand is soft and deep (see Plate 9). They are often close to trees, which provide shade as well as support by their roots in the soft, sandy ground. Warrens of the southern hairy-nosed wombats can be shared by up to 10 wombats, who graze the area around the warren as far as the smaller, perimeter burrows. This grazed area forms a halo of cropped grass, about four hectares in area. The perimeter burrows are used as temporary refuges by the grazing wombats and are also used by young wombats who have been driven out of the warren. Johnson and Crossman used telemetry to follow the movements of 28 adult northern hairy-nosed wombats. They found that most burrows of the northerns are occupied by a single wombat about 70% of the time. Some burrow sharing occurs in the multi-entrance burrows, usually between females only. What does a wombat burrow look like?